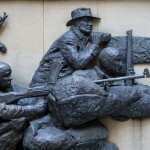 The memorial consists of a gently curved wall of Sydney sandstone onto which a series of bronze bas-relief sculptures are attached to represent the soldiers of the original three battalions of the Royal Australian Regiment. 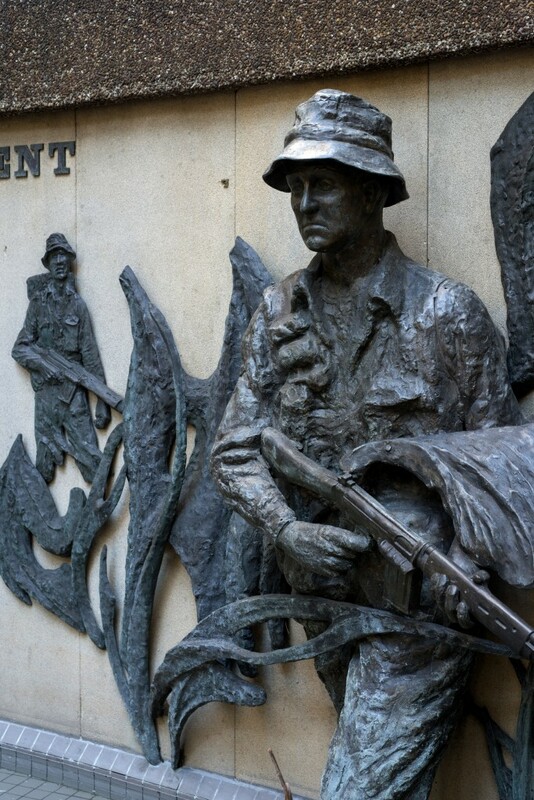 An infantryman standing in front represents the nine battalions that served in South East Asia. The sandstone wall measures 8.23 metres in length and 1.50 metres in height. In front of the wall is a small pond with decorative aquatic plants. 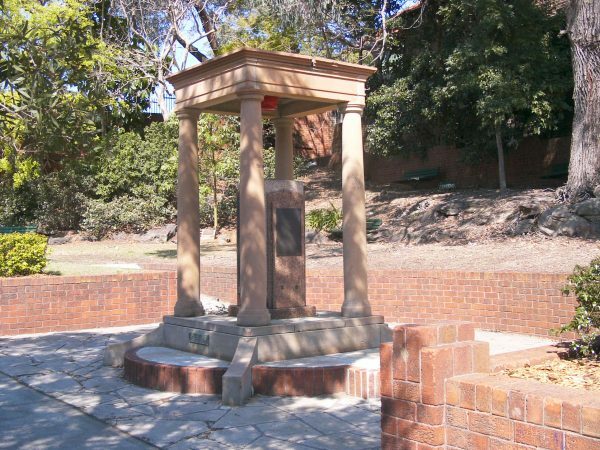 The memorial was erected to commemorate the foundation of Australia’s first regular operational infantry regiment and is located in small, pedestrianised square, known as Regimental Square, between George Street and Wynyard Lane. 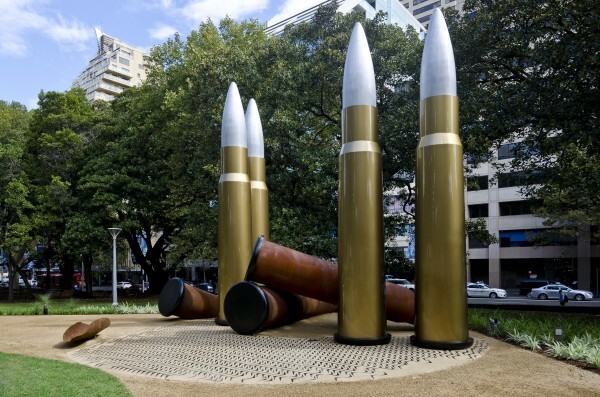 This war memorial is one of only a few commemorating the South-East Asian wars. 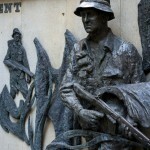 It remembers soldiers who fought in Korea, Malaysia, Vietnam, Malaya and Borneo. Dennis Adams was born in Sydney in 1914 and studied at the Royal Art Society in Sydney and Royal Academy School in London. He joined the 18th Battalion, and was later seconded to the Department of Home Security for camouflage work on RAAF Stations. In 1942, he was appointed war artist and in 1943 made Captain in the Military History Section of the Australian Imperial Force. He went on to serve in New Guinea, Middle East, Italy, Egypt, UK, France, Belgium, Newfoundland, Canada, the Bahamas, USA and Japan. Adams received the Order of Australia Medal in 1989. 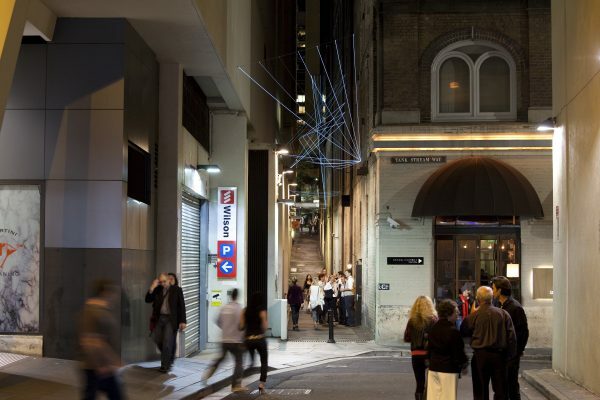 The Royal Australian Regiment Association chose Adams for this work following a recommendation by Sir William Dargie. 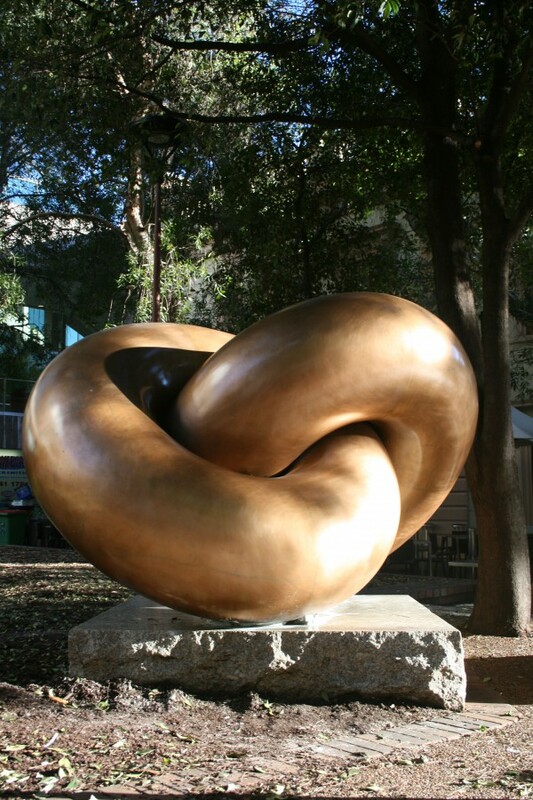 Adams had already undertaken several other sculptures including some for the Australian War Memorial in Canberra. 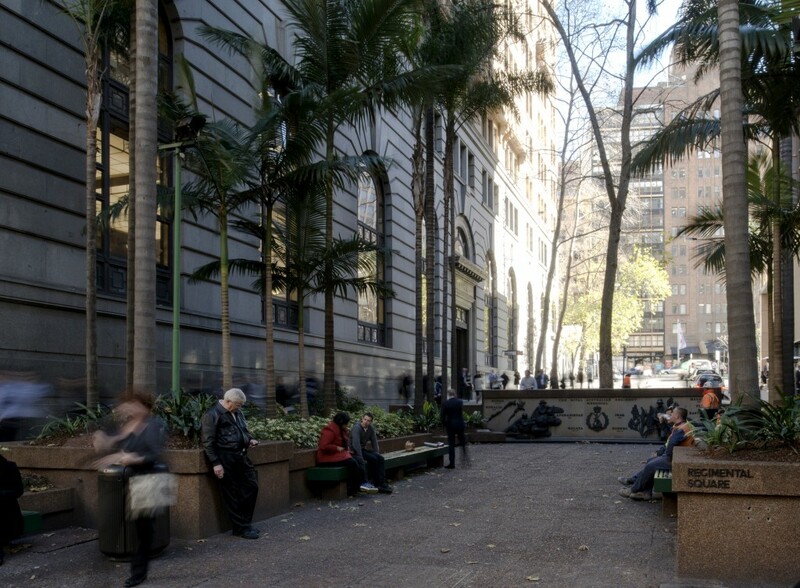 The square and memorial were associated with implementation of the City of Sydney Strategic Plan in 1971, which provided for local precinct action plans. Part of these plans included the closure of minor roadways and lanes and the creation of pedestrian plazas. 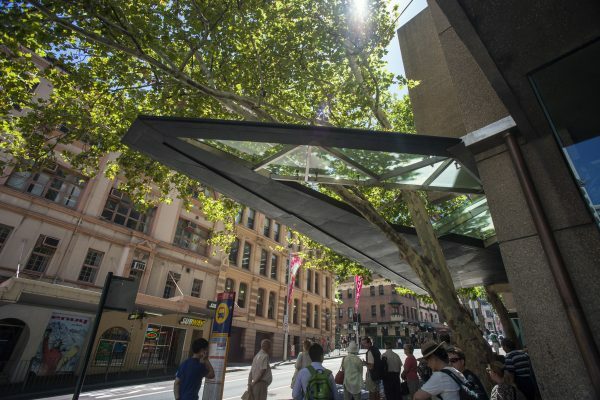 Streets affected under this plan included Martin Place, which became Sydney’s the first pedestrian plaza in 1972, and Wynyard Street, which was closed to traffic and transformed into a pedestrian plaza in 1973. 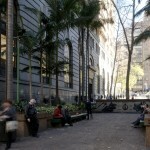 The Bank of New South Wales and the Bank of New Zealand each contributed $10,000 to the cost of the streetscaping. 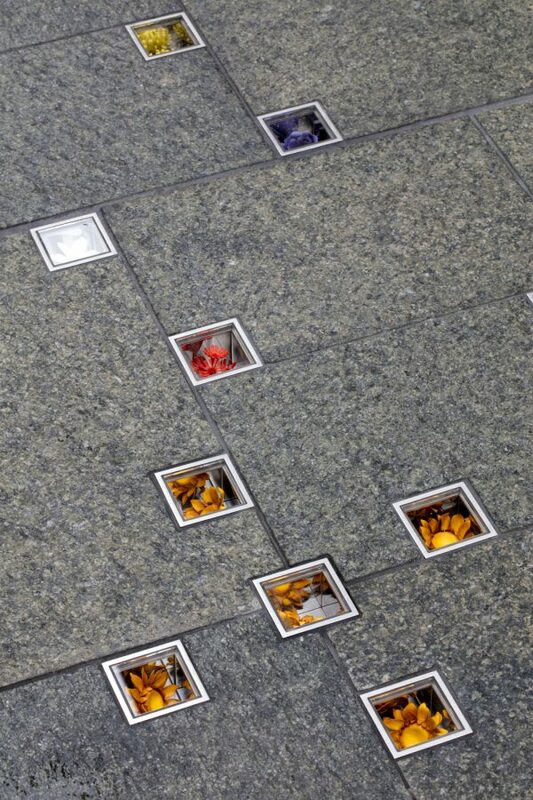 At first the name Kapyong Square was chosen for the pedestrianised square, commemorating the battle of the Korean War. This was recommended to the Geographical Names Board of New South Wales. The Regiment later requested that the name be changed to Regimental Square to honour the memorial and to recognise the fact that the site was part of the Army Barracks in the early 19th century. 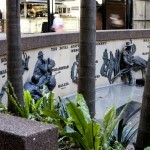 Service members and other organisations and individuals paid for the work on the memorial wall, which was unveiled at noon on 8 December 1976 by Sir Roden Cutler, the Governor of New South Wales. Alderman Leo Port, the Mayor of Sydney, officially opened Regimental Square at the same function. 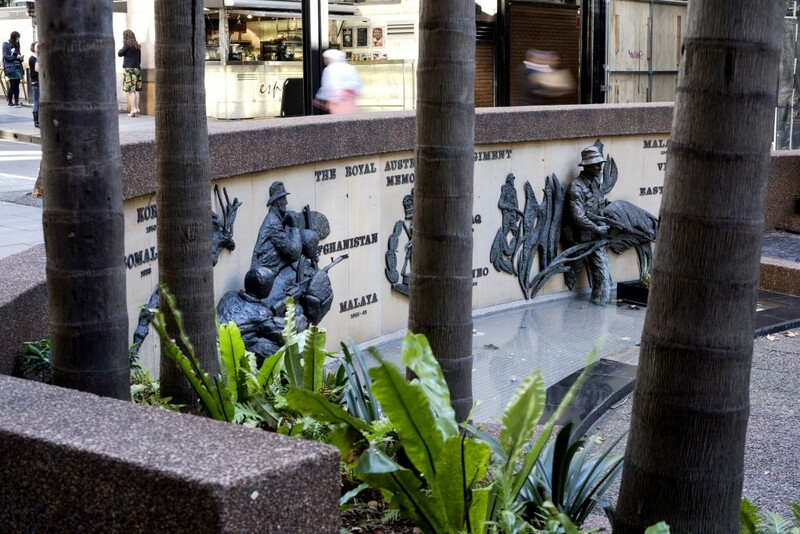 The memorial was handed over by the Royal Australian Regiment Association to the City of Sydney on the same day. 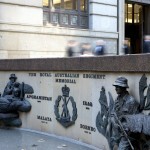 On a plaque facing east, an inscription reads: “The Royal Australian Regiment / Memorial / This memorial commemorates the foundation of Australia’s / first regular operational infantry regiment. In the past / Australia has had permanent military units with special / functions, such as coastal artillery batteries and earlier, / other units seconded from the British army. / The first three battalions of the Royal Australian / Regiment were formed in 1945 from volunteers from the / Second A.I.F & served in various theatres of war to /safeguard our nation. 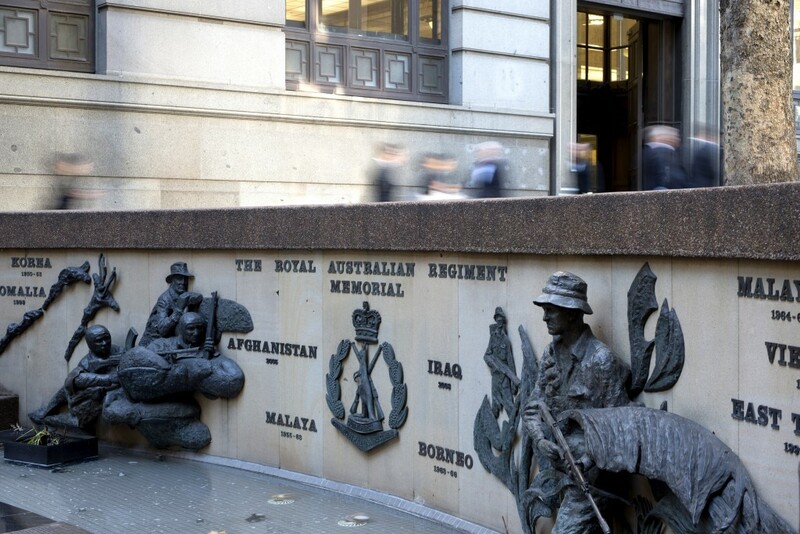 / The Royal Australian Regiment Memorial honours all ranks / who have served or who will serve in it and above all /those who have made the supreme sacrifice”. 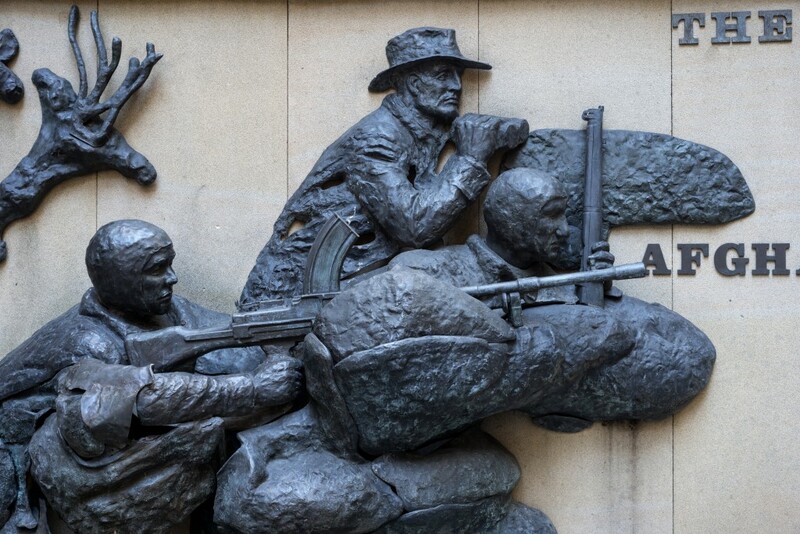 An inscription on the sandstone wall reads: “Royal Australian Regiment / Memorial / Korea / 1950-53; Malaysia / 1964-65 / Vietnam / 1965-72 / Malaya / 1955-63; Borneo / 1963-66 / Dennis Adams”. In November 1980 vandals attacked the memorial wall removing the head, hands and gun of the sculptured soldier on the northern side as well as sections of the sculptured foliage. Adams undertook the restoration work at a cost of $984. 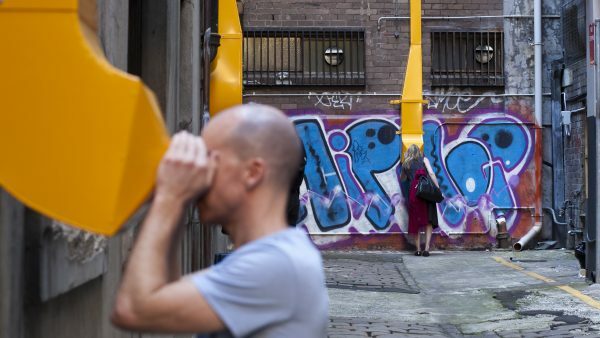 A later second act of vandalism damaged the garden and removed the floodlights. other units seconded from the British army. those who have made the supreme sacrifice.